Tiger Woods was the architect of arguably the greatest sporting comeback of all time at Augusta on Sunday, as the 43-year-old swept away years of crippling injuries and personal issues to clinch The Masters for the fifth time. On a Sunday that just seemed meant for Tiger, there was barely a dry eye on the course after celebrating the improbable victory with his children – some two decades on from the iconic shot of him embracing his late father Earl after his first triumph. 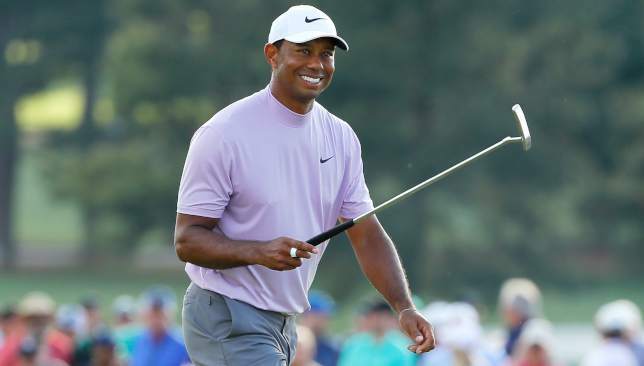 Donald Trump, Barack Obama and Serena Williams were among those who flocked to social media and congratulated Woods on an unfathomable achievement that ended his 11-year drought between wins at a major. It moved him onto 15 majors in total and three behind Jack Nicklaus – and matching or even surpassing the fabled mark of 18 suddenly doesn’t seem so distant. Watch Tiger’s thoughts above at the end of an emotional four days. “It’s been a while since I’ve been in contention here, but then again the last two majors counts for something,” said Woods, who finished runner-up to Brooks Koepka in the 2018 US PGA at Bellerive. The final group of Molinari, Woods and Tony Finau will tee off at 09:20 local time (17:20 UAE), with both Woods and Finau two shots off the pace after Molinari’s flawless third round of 66. “Usually the reward for playing hard and doing all the things correctly is you get a nice little sleep-in come Sunday, but that’s not going to be the case,” Woods added. “We’ve got to get up early and get after it. “My desire hasn’t changed. I’m just thankful to be able to come back here and play again. Last year was a step in the right direction and we built a season around that and then here we are. “I always feel pressure. The day I don’t feel pressure is the day I quit. I always thought that if you care about something, obviously you’re going to feel pressure. Tiger Woods had the biggest gallery at the third round of the Farmers Insurance Open, but didn’t make much noise. Woods birdied three of his last five holes to salvage a 71, leaving him 13 shots behind and in search of moral victories in his 2019 debut. He was at 5-under 211. “Well, you know, just something positive, you know, I think that, if I can get to double digits it would be nice and just a nice way to end the week. I got to play a little better then I have,” Wood said.